This week for the Food: A-Z Project was the letter "P". It was hard to decide what to do for it, there were so many options. I ended up doing two. Poached Eggs - I've never actually poached an egg before, never really had a reason or want to do it. I guess I was always kind of curious about it though so I figured now was as good a time as any to do it. There's all kinds of tips and tricks people do to make them just right. I made sure the temp of the water was between 160-180ºF and put in a bit of white vinegar as it's supposed to keep the egg together. 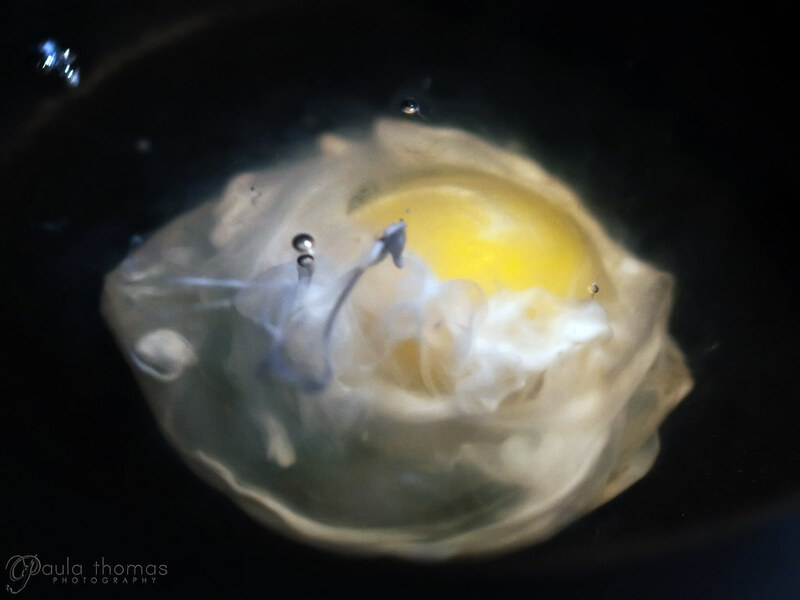 I cracked the egg into a ramekin, swirled the water around with a spoon and dropped the egg into the middle and watched as the egg swirled slowly around while I took pics. I read about other tricks people do like put the egg in plastic wrap so it stays together. That seems too easy to me and it's not as purdy either. Pizzelles - This is probably only the 2nd time I've made them. 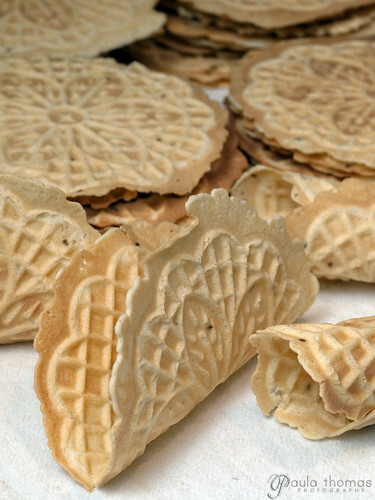 They're an Italian cookie that requires a special pizzelle maker that looks just like a waffle maker. It makes crispy thin wafers that are addictive. I think I ate about 10 of them today. They're so light and thin you just want to keep eating them. Most of the recipes I found are basically the same with just a few minor differences. I followed one I found on PennLive.com with a few adjustments. I used Anise extract instead of anise oil and added a bit of rum. In a large mixing bowl, beat eggs; then slowly whisk in sugar, cooled melted butter, Anise extract, seeds and water. Slowly mix in flour and baking powder mix. Set aside and refrigerate for 15 to 30 minutes before baking. If the batter becomes too thick, whisk in small amounts of water. Spoon one tablespoon of batch per cookie on a pre-heated Pizzelle iron. Latch the handle so it makes a tight fit. After the initial steam escapes from the iron, take care to not over bake them. They should be slightly golden brown, but not dark. I prefer mine light. Check them after 10 seconds. Remove them with a fork and set them on a flat surface for drying before they are stacked. A course dish towel is good because it absorbs any residual moisture. Home made Pizzelles are not necessarily perfectly round like the cardboard commercial ones. Homemade ones can be any shape that comes out of the iron. That's a symbol of genuine homemade greatness. Store them in an air tight container. 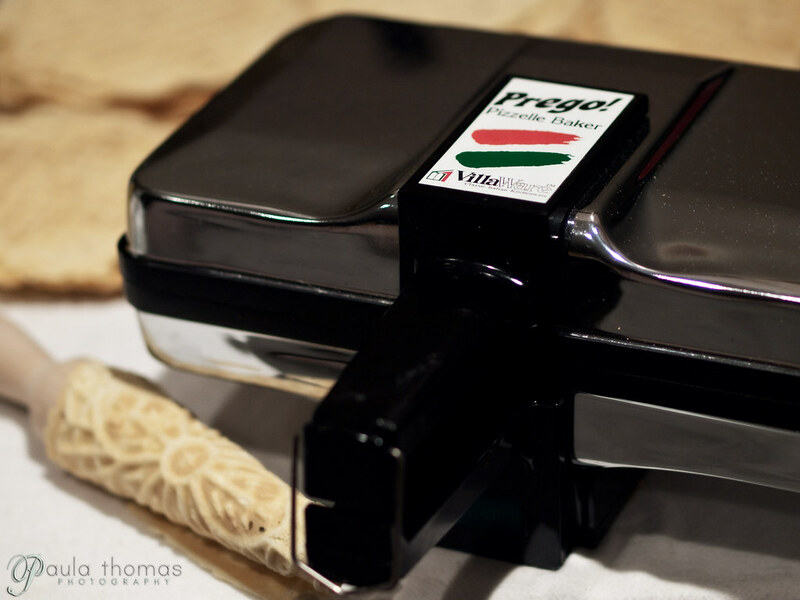 A tin is a traditional favorite for storing pizzelles because it keeps them fresh and crisp. 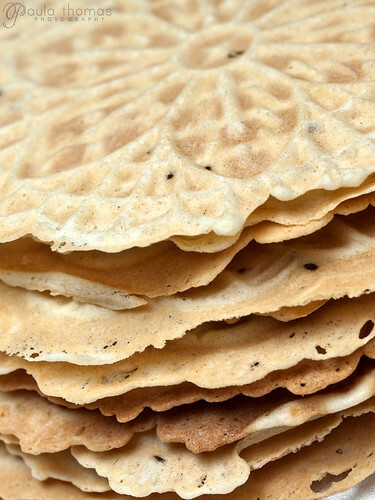 The best pizzelles are so thin that it is difficult to transport them without breaking a few. If your pizzelles cookies soften due to high humidity, place them in a slightly warm oven for about ten minutes. Each batter makes around 35-40 thin cookies. Excellent photos. I absolutely *love* pizelles; one of my favorite cookies!